Muscle and Meat Biochemistry teaches the different concepts and topics under the eponymous subject. The book covers the gross and detailed composition and structure of muscles and the relationship of the nervous system with the muscular system; muscle cell differentiation and growth; proteins of the thick filament; and the molecular structure and enzymatic activity of myosin. The text also discusses the proteins found in the thin filament - actin, troponin, and myosin; skeletal muscle growth; protein metabolism; and fiber types. 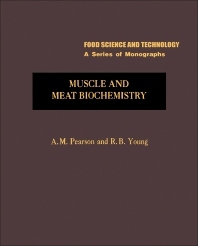 The book also encompasses cardiac and smooth muscle; sarcoplasmic proteins; the connective tissues - collagen, elastin, and ground substance; and the postmortem changes during conversion of muscle to meat. The text is recommended for advanced undergraduate and graduate students, as well as for scientists who would like to know more about muscle biology, muscle physiology, and meat science.